The entire Li range uses the same design gearbox but there are quite a few different gearboxes available. It is quite common to find loose gears and it can be hard to know what gearbox it is from. This section should help you make sure that you either have the right gearbox in your Lambretta or even identify that odd gear you found. Also you are able to check when you have a valid combination that works OK, especially when you are buying a scooter in parts this can be very help full. 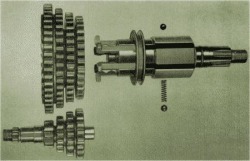 The gearbox exist out different section; the cluster, the 4 gears itself and the sliding dog with main shaft. Check the gears page for details. So you have your big box of loose gears and now all you have to do is identify each single gear. This table will start you in the right direction. Use it in conjunction with the individual gear identification to positively id any gears that are not obvious.